Generating Power From Revolving Doors | OhGizmo! In a typical office building thousands of people pass through revolving doors on a daily basis. Multiply that by the number of buildings in a typical city, and you can see why harnessing all that human power is actually not a bad idea. 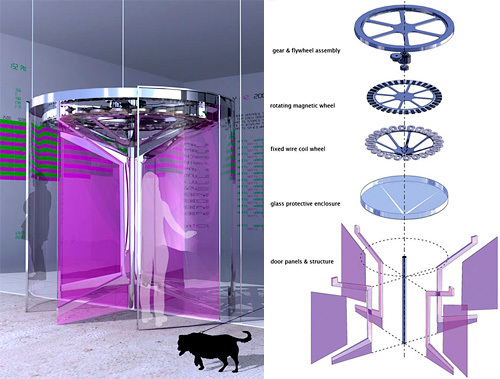 So the Revolution Door from Fluxxlab in New York is basically a turbine that’s powered by people as they enter or exit a building, just like how water powers a turbine as it rushes through a hydroelectric dam. The Revolution Door uses a redesigned central core to efficiently convert the motion of the spinning door into electricity, and in theory could provide a source of free energy to the building where it’s installed. I had a similar idea for the office where I used to work, but it involved harnessing the power from my office chair while I killed time just spinning in circles. Of course that would probably have been canceled out since I spent the other half of the day playing FreeCell, but I still felt like I was doing my part to help the planet. There was a story about this on invention nation two weeks ago.